I have been using my Moto X for about a week now. Thought of recording some initial impressions. First, some background on me. I used the G1 when it came out. Ever since Nexus One, I have been using a Nexus phone. Except for Nexus 5, I upgraded to every single Nexus phone as it came out. Moto X is the first ever non-Nexus Android phone I have used. I had been using a Nexus 4 since it came out in 2012. I wanted to upgrade to a newer hardware. I didn’t go with the Nexus 6 because it’s too big. Also, Motorola has a good track record when it comes to pushing new versions of Android more quickly than other OEMs. Getting updates quickly is critical to me. Moto Maker is awesome. Designing and ordering the phone was a breeze. I got to pick and choose colours, which was amazing. All Nexus phones have an all-black front, but with the Moto X, I was able to get a white front... something I have always wanted. The phone is very fast. 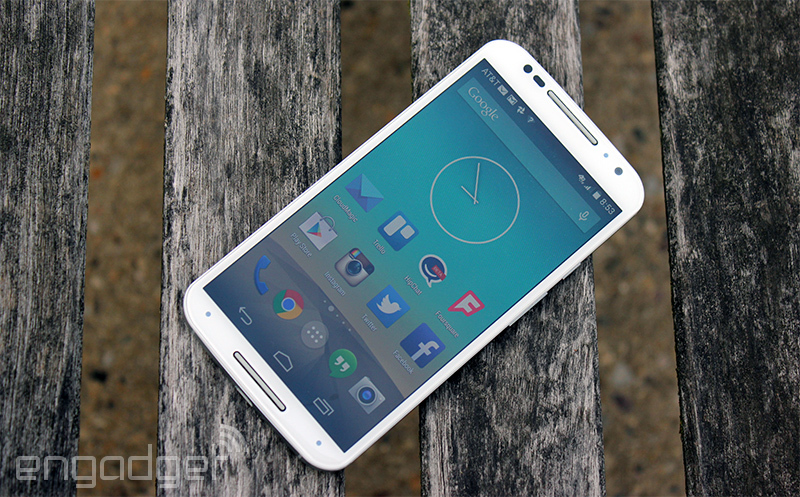 Surprisingly, Moto X boots a lot faster than its more powerful sibling Nexus 6. (Maybe it’s because of the Nexus 6’s encrypted storage, which is known to slow things down.) In my usage, I never had to wait for the phone; it was fast in everything it did. The screen is gorgeous. Upgrading from Nexus 4’s dull screen, this is a pleasure to look at. I’d put this screen above the Nexus 9’s screen (the other Android I use on a daily basis). The camera is passable (sample pictures). With the top and bottom looking almost the same, it’s kinda hard to tell if you’re holding the phone upside down. But you’d quickly learn to orient the phone correctly. The edges are metal, which made it uncomfortable to hold the phone while talking. Maybe this is another thing that I’ll get used to over time. The phone does not have a stereo speaker like the Nexus 6, but it’s pretty loud. Notifications and phone calls are also much louder than the Nexus 4. Finally, I can hear when my phone rings in the next room. In-call sound clarity was also noticeably better than the Nexus 4. This is the first time I use a non-Nexus phone, so I wasn’t sure how Motorola’s software additions will affect the experience. So far, I have been fairly happy with what Motorola has chosen to add to the phone. The phone has infrared sensors to detect when you reach for the phone. The moment I am going to grab the phone, screen turns on automatically. I never have to press the power button to turn the screen on. It saves maybe half a second, which may not seem like a lot. But it does matter because I know I am annoyed when my Nexus 9 doesn’t automatically wake up when I want to use it. Similarly good is “shake to open camera” gesture. With my previous phones, I’d have to press the power button, open camera by sliding the lock screen, and then start shooting. Now I can simply shake without even having to look and the camera is ready. I really like it. The camera is supposed to capture more shots than the ones you take and suggest you to keep the better shot. I haven’t had the phone long enough to actually need that feature yet. Possibly my most favourite feature is you can customize the “Okay Google” phrase and choose anything you like. I have never liked saying Okay Google, so this is a big plus for me. Speech recognition is good, and voice commands are useful. When I need to do something quick — like a unit conversion or adding a reminder — I turn to my phone and ask it to do it. No need to wake it up; no need to unlock the phone. It just works. Motorola slowly teaches you how to effectively use the phone by showing notifications about new features every once in a while. It’s way better than dumping everything at you while setting up the phone. Nexus phones come with a dialer app that has two nifty features: you can search for local businesses from within the dialer and it does reverse business lookup when you are making or receiving a call. If I want to call Pizza Hut, I can type Pizza Hut in the search box of the dialer app and it’ll find local Pizza Hut’s phone number. Similarly, if Fedex calls me to alert me about a package, caller ID would show “Fedex” instead of the number they are calling from. Moto X does not come with this dialer, which is a bit of a letdown. I am mostly used to it now, but I sometimes find the phone a little too large to hold and use. Especially when I have to use it one handedly. It’s been raining this week, so I have been driving to work since yesterday. Driving to work means I need to take the Shoreline Boulevard exit from 101N freeway. Turning right after the exit takes you to Google offices, while turning left takes you away from Google. Naturally, there’s a very long line on the right turn lanes while left turn lanes are almost empty. When coming to work this morning, I thought I would turn left from the exit and then take a U turn after so I don’t have to wait on Shoreline exit. I had passed about half of the line on right-hand side lanes when I spotted a gap in the line. I squeezed in and started waiting in there. That’s when I realised I was being a jerk. Everyone in the line has joined at the end and moved forward slowly. Jumping the line and joining in the middle is impolite. We won’t do that where people stand on the line — they’ll give us a dirty look and quite possibly ask us to join the line from the end. But because they cannot do anything when everyone is sitting inside a car, it doesn’t suddenly become okay to not follow etiquette. I felt bad enough to leave the right turn lane and go with my original plan. I took a left, took a U turn, and got to work. Maybe it took me a bit longer, but I don’t feel like a jerk. That’s a good thing.